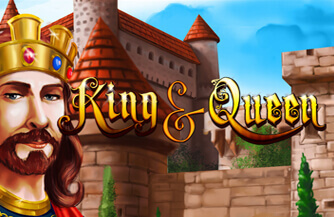 King and Queen is a 5 reel slot game with up to 30 paylines by Gamomat. This fun medieval themed game features Scatter symbols, Free Games and an additional Gamble feature. 7 Free Games are triggered by finding 9 Scatter symbols on reels 2-4. During the Gamble feature, winnings are double by correctly guessing red or black, and they are quadrupled by correctly guessing suit. Winnings may be gambled up to 5 times.